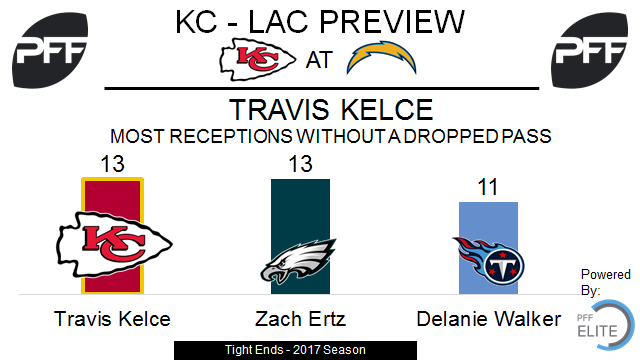 TE Travis Kelce vs. Safety Jahleel Addae – Kelce has started the 2017 season right where he left off in 2016 as one of the best tight ends in the NFL. He is PFF’s fifth-ranked tight end so far this year with an overall grade of 83.8. Kelce has the most receptions for a tight end without a dropped pass with 13, and his 2.10 yards per route run is seventh of tight ends with 30-plus snaps in route. Addae’s 76.3 PFF grade is 29th of 79 qualifying safeties this year. He’s been targeted five times in 70 snaps in coverage and allowed three catches for 12 yards. His 0.17 yards per cover snap ranks 12th of 57 safeties with a minimum of 50 snaps in coverage. T Mitchell Schwartz vs. Edge Melvin Ingram – Schwartz is ranked 44th of 72 qualifying offensive tackles this year with an overall 48.3 PFF grade. He has allowed one sack and six total pressures in 73 pass-block snaps, and is the 37th ranked tackle in PFF pass-blocking efficiency (pressure allowed on a per snap basis with weighting toward sacks). Ingram already has three sacks and 13 total pressures through two games this season. He is ranked second in PFF pass-rushing productivity among all edge defenders with 30-plus pass rush snaps. RB Kareem Hunt vs. LB Jatavis Brown – Hunt has been dominant in his two NFL games, leading all running backs with 14 missed tackles forced in 38 touches this year. He is our top ranked running back so far this season with an 87.1 PFF grade. Brown has been excellent against the run in 2017, leading all NFL defenders with 10 stops (plays graded as a “loss” for the offense) in 61 snaps against the run. He has struggled in coverage, allowing eight receptions for 85 yards and one touchdown. Brown is currently 45th of 68 linebackers with at least 20 snaps in coverage in yards per cover snap at 1.23. QB Philip Rivers vs. Kansas City Linebackers – Last year, Rivers wasn’t too bothered by Kansas City’s defense. His passer rating overall on the season was 87.9 and his adjusted completion percentage was 74.0. Against the Chiefs in two matchups last year, his passer rating was 86.1 and his adjusted completion percentage was 78.1. Part of that success was Rivers’ production against the Chiefs linebackers. In the first matchup of the two teams Derrick Johnson, Justin March-Lillard, Frank Zombo, and Dee Ford all had ratings of 100.0 or more when Rivers threw into their coverage. 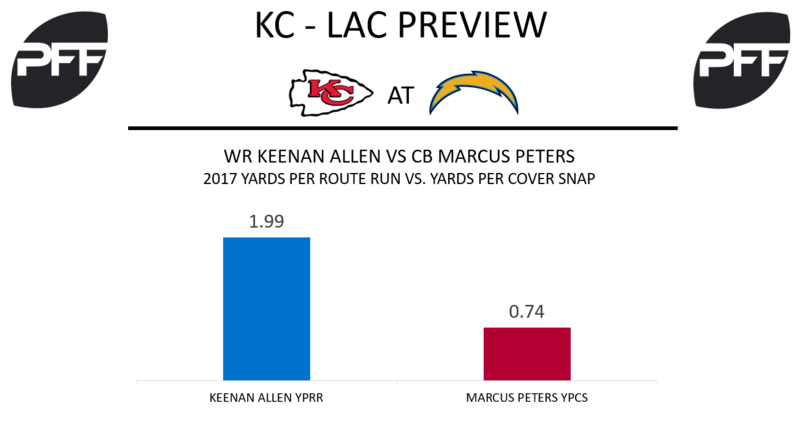 WR Keenan Allen vs. CB Marcus Peters – This will be a pivotal matchup for the Chargers. If they don’t want Kansas City to sit too closely to the line of scrimmage, they’re going to need Allen to continue to be successful on the outside. Allen has been productive thus far this season, as he is 13th in the league in yards per route run (1.99 YPRR). Peters has not been quite up to his usual standard thus far. His passer rating allowed when throwing into his coverage (101.6) is more than 35 points higher this year than last year. While Allen didn’t play but a half last year, he did torch Peters in that half to the tune of 4 catches on 4 catches, and Allen would come away with a 104.2 receiver rating overall in that game. T Russell Okung vs. EDGE Dee Ford – The Chargers brought in Okung to protect Rivers from the monster pass-rushers in the division. His pass-blocking efficiency of 94.9 (tied for rank 31) in Week 1 versus Denver was passable. On the season his overall PBE is slightly better at 95.6, good for being 19th ranked. He is also the 28th overall tackle in PFF grading at 72.0. He’ll likely face a lot of Dee Ford this week, as Ford has spent 72.6 percent of his pass-rushing snaps rushing on the right side of the defense. His pass-rush productivity of 6.5 on the season is ranked 40th through Week 2 among edge defenders. Justin Houston, Kansas City’s other star pass-rusher, has a PRP that is ranked 12th through two weeks (12.1).